Jesse Chambers, otherwise known as Liberty Belle, vacations with her husband after a long week of adventures with the JSA, as chronicled in the last seven issues. She recalls, as a child, working with her father, Johnny Quick, to learn how to use the magical equation as a focus to use powers. Her mother, lamenting that Quick was pushing her too far and too fast, struggled with Quick as to whether making her daughter "special" when she already is special in her own right was good parenting. This lead to a divorce. She recalls living with her father through college, and ultimately seeing him die to save him from Zoom, only to later lose her own powers. Zoom, at present, flees from the JSA. Green Lantern appears, warning Damage that he can't pursue the villain with them into Georgia without violating the terms of his deal with Georgia, whereby they would not charge him for losing control of his powers in exchange for him never going there again. Eating dinner with Hourman, Jesse gets a call from Power Girl saying that Damage has taken Zoom hostage in Atlanta. Liberty Belle goes to talk Damage down, entering the building and convincing Damage that despite the fact that Zoom destroyed the features of his face, and despite the fact that he's flawed, he's still worthwhile and shouldn't give up. Zoom goads Damage on, but Damage powers down, ending his threat to Atlanta. Frustrated, Zoom launches debris at Damage fast enough to kill him. Using the Johnny Quick equation out of the blue, Liberty Belle saves damage, knocking Zoom cold. 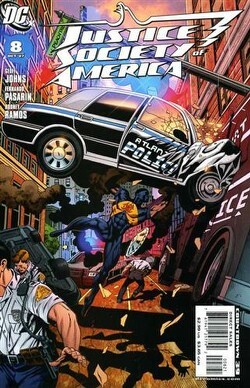 The police threaten to take Damage in, but the JSA stand in their way and secure his freedom. They end up at the vacation spot Hourman and Belle were using, celebrating as a reunited family from the broken pieces of before. Story - 5: Phew, going from reviewing Action Comics #853 to this is a real breath of fresh air. Character, compelling dilemmas, and a rational point for every move made in the plot. I suppose it could be argued that there are eight pages of rehash in this book, an extrapolated vision of what has happened in the history of Jesse Quick. Probably true, if you want to niggle about it. Isn't that what I just complained about with Mr. Action? Well, yeah, with one key difference. This extrapolation adds to and fully fleshes out the character, it is intrinsically related to the theme AND final dilemma, and it's written in such a way that every panel is compelling and holds your attention. THAT is the key difference. Beyond that, there's equal parts new information with every piece of information you might know, and chances are good that you might not know as much about Jesse, whereas if you don't know Jimmy's going through power changes, you're probably not reading comics at all. Regardless, Zoom and Damage is an incredible climax, the Quick family is a thematic dilemma that follows the book's intended purpose well, and I can't believe Geoff got this much story in just the one issue. I'm eager for Kingdom Come, but still, one hell of a story. Art - 5: Honestly, I thought this was Eaglesham and his typical work. Great choice of artist for consistency, great art in general, and entirely fitting for this story. I've never heard of Pasarin, but after seeing his work here, I'm going to watch for him. He's great in this capacity, and the story is finely rendered. 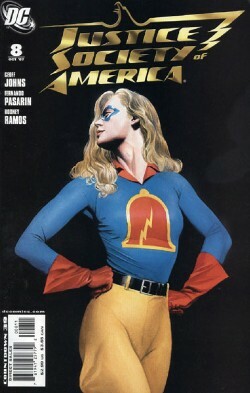 Cover Art - 5: I thought it would be impossible to ever make a pair of slacks hot on any chick other than Lois Lane. To quote Locke: I was wrong. But beyond that, good composition given the format, great colors, awesome, classic example of what makes Ross great. I'm just BEGGING to pounce on how tired this concept is, and at times I can, but I'm pushed back month after month by the sheer quality of these incredible pictures. What's even better, they all relate to the character examined, they're all gorgeous, and they're all frameable.